Building great teams doesn’t happen overnight. It requires an overall human resource planning strategy that goes beyond team building exercises. That being said team building exercises don’t hurt, according to CEO.com. What matters is the right team and the right exercises. 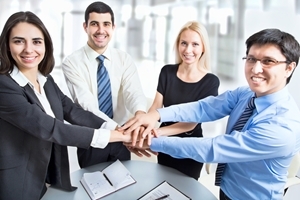 Ideally, a team works together because the members are all people who fit into the culture of the workplace. This returns the concept of teamwork to the now common discussion of whether or not companies should hire for culture. According to ERE, hiring for culture, when done in the right way, is ultimately a good thing. Working with people who are very different from each other can also be a good thing. Workplace diversity is founded upon the idea that people with different backgrounds have different perspectives; by using a strategy formed from a group of unique people who work together, workers can forge a stronger company. If hiring for culture means hiring against diversity, then someone is making a mistake. The best culture a company can have is a diverse one. When everything thinks and acts alike, then everyone will consistently make the same mistakes. Instead, hire people who are different from each other but also complement each other and get along. If your team has a weakness, then hire for strength in that area. This way, people will have different skills that all complement the overall teamwork of the company. After hiring the right people, how do you make sure you get them to find each other and get along? Ideally, team building exercises are ice breakers that let people get to know each other in ways that will stick, allowing everyone to bond and form a tactical unit. CEO.com recommends looking for team-building activities that improve communication and help people understand each other better. Activities should also center on making decisions together and forming a group consensus, along with the ability to plan as a group. Ultimately what a team has behind it is a trust that is formed through bonds. People in teams make bonds when they experience and overcome hardship together. When every person on a team trusts every other person, then people won’t second guess someone or become angry and frustrated. People will know what their own personal strengths and weaknesses are, and they will work together in tandem as a unit.